Discover the spectacular sights of Berlin at your own pace on a full-day customizable private tour led by a knowledgeable guide. 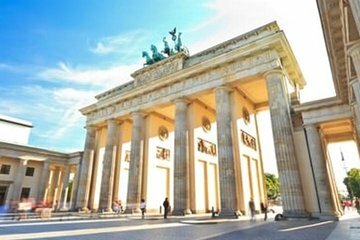 Travel in a luxury private vehicle to arresting landmarks like the Brandenburg Gate and the Reichstag parliament building while listening to informative commentary from your expert guide. Relish the flexibility of this private tour by adapting your itinerary according to your interests; perhaps head to the East Side Gallery to see the vibrant art that decorates the Berlin Wall, or spend a moment reflecting at the poignant Holocaust Memorial. Enjoy an authentic German lunch in a local restaurant recommended by your guide when hunger strikes. This was our first tour during our week in Berlin and it was a great way to get oriented to the city. Daniel our tour guide and his driver were absolutely superb. Tiergarten, Brandenburg Gate, Museum Island, Chancellery and surrounding government buildings, Checkpoint Charlie, Holocaust Memorial, and Berlin Wall were among the many interesting sites. Good balance of driving and walking. Daniel kept things extremely interesting and offered rich insight into German culture past and present. What a great way to begin our vacation in this fascinating city! The private tour was wonderful because it allowed us to see a lot at a pace that was comfortable. Our guide Daniel was super friendly and knowledgeable--a real delight! Thank you, Daniel, for making our first day in Berlin so memorable. Ana was fabulous. in 6 hours we felt like we really got to know Berlin. highly recommend.